At weekends we love getting outdoors in our local area. Long walks with our puppy in the countryside or having a stroll around the wonderful independent shops in our local town of Stroud are a couple of our favourite weekend activities. But sometimes (especially on those chilly, rainy days), there really is nothing better than a day at home snuggled on the sofa with a hot drink and a movie. We’ve shared a few of our favourite boxsets and films for you to enjoy on your Saymor sofa. So, why not put your feet up, grab a cuppa, and unwind in front of the TV this weekend. Unless you’ve been living under a rock since its release in 2016, you’ve probably heard a lot about Hollywood blockbuster musical La La Land. 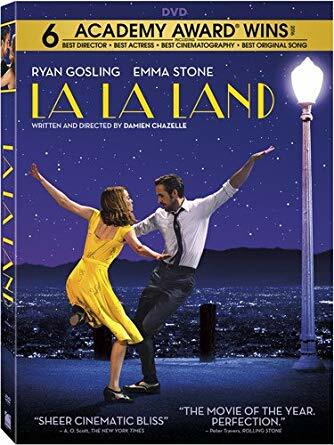 Featuring two of the biggest names in the industry, Ryan Gosling and Emma Stone tell the story of an aspiring actress and a dedicated jazz musician chasing their dreams in modern day Los Angeles. An uplifting, inspiring watch to brighten up your weekend. Game of Thrones has become somewhat of a cultural phenomenon since the first episode aired back in 2011. The medieval fantasy has several plots and a very large cast, so it’s a little difficult to give an overview of the whole 7 series to date. We recommend you give it a watch from series 1 (don’t try and start from a later series or you will be lost!) and see the magic for yourselves. If you’re up to date on all the episodes to this point, season 8 (the finale) will return this April. A great series to watch in evenings during the week or save for a weekend binge. We couldn’t list our favourite films without including one related to sleep! Nominated for 8 Academy Awards, this is one of our favourite Christian Nolan films. Leonardo DiCaprio tells the story of a skilled thief who steals information from deep within the subconscious during the dream state. Total concentration and engagement is needed to stay on track of the complex storyline, but you’ll be rewarded for it when everything just ‘clicks’ at the end. The perfect brain teaser for a rainy Sunday. Weekends at home are a family affair, so our next option is perfect for adults and children alike. This Pixar classic is one of our favourite films, showing the secret life of Andy’s toys Buzz, Woody and a handful more. It encompasses the true magic of childhood and is the perfect animation for a family film day. Keep an eye out for Toy Story 4 coming to cinemas this summer! A classic, British period drama. The story begins in 1912 and follows the lives of the Crawley family and their servants in their Edwardian country house. The TV show touches on historical social and political matters for the time period and gives a unique insight into British culture. An easy, relaxing weekend watch. Spending time at home is an important part of family life, and we want to make sure that your living room is a comfortable, cosy place for the family to enjoy. That’s why we’ll be opening our brand-new Sofa Studio in our Stroud store really soon. We’ll be showcasing a range of sofa styles from our UK based manufacturer, available in many different fabrics and colours. More details to be announced soon!